Is College Planning Driving You Crazy? Somehow, watching as your children decide which schools to apply to is as stressful for you as it is for them. If you’ve found yourself contemplating essay forgery, scheduling five college tours for a single holiday weekend, and obsessively checking the U.S. News and World Report rankings, you may be on the verge of freaking out. But as a parent, it’s important to (try to) remain calm and help keep everything in perspective. 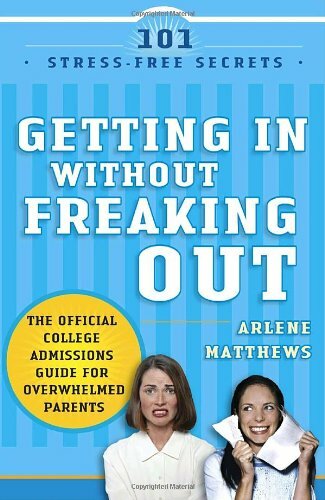 Written specifically for parents and their college-bound teens, Getting In Without Freaking Out is an insider’s guide to the application process by professional college coach Arlene Matthews. Years of experience have taught her the secrets of playing the admissions game without all the anxiety. Now, Arlene shares what admissions officers won’t tell you—that getting into a great college isn’t as hard as it seems! You’ll learn . . .
As entertaining as it is practical and realistic, Getting In Without Freaking Out is the only guide of its kind—one that helps you get through the getting-in process with grace, good humor, and knowledge that will enhance your student’s chance of success.